In European history, the Medieval period – that long, Gothic dawn that came after the cold night of the Dark Ages – is considered a quiet time of prayer and study with very little that could be called innovation about it. In fact, that is not the case. Particularly after the leveling scourge of the Black Death, society, art, architecture and religion began to reach toward the impending Renaissance like vines curling up toward the sun. In seafaring, too, a remarkable change took place that would lead to the great ships of the golden age of sail. What is known in general as the “round ship” and is technically referred to as the “cog” became the workhorse of Europe’s northern coasts some time during the 13th century. From then until nearly the 16th century, the cog was put to multiple uses but for the most part was thought of as a cargo vessel. Unlike the Viking longboat on which it was based or the galleys that dominated the Mediterranean, the cog was powered by sail. 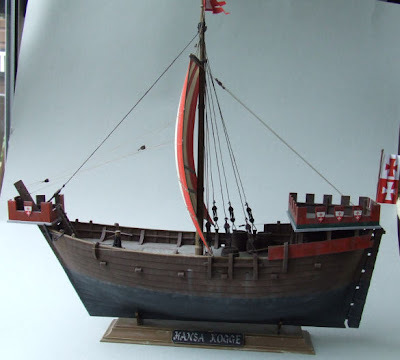 Though longboats and galleys of the time generally shipped a sail, their masts were strikable. In a cog, the mast was fixed and carried a single, square sail. Although this did not maximize wind power by any means, it alleviated the need to make room for men and oars. This left the round bottomed cog’s hold available for cargo. Most items moved by ship in the North Sea, the Baltic and on the Atlantic coast of Europe were carried by cog. The high fore and after castles that can be seen on the model above were lightly framed structures that could be used for storage – even the castles could be packed with cargo – or defense depending on need. Cogs were used to great advantage in sea battles. Despite their relative lack of maneuverability (when compared with, say, an 18th century frigate) their castles were perfectly suited for armed men, particularly with bow and arrows at the ready. Advancing the possibilities of a large ship’s maneuverability, however, was probably the cog’s greatest innovation. Up until the 13th century, ships were steered via a starboard-side oar. Though adequate, the oar made coming about a slow dance in a big circle. The builders of the cog equipped it with a hinged rudder right aft on the sternpost. This was operated via a series of tiller ropes. The Hansa cog above gives a clear picture of this invention that allowed a tighter turning radius and a more responsive helm. The general build of the cog caught on in the Mediterranean as well. There t was known as a dromon and the general build originated some time in the 9th century. This makes the cog vs. dromon question very much a chicken or egg kind of argument but in the end the point is mute. The mighty cog that changed the way ships were built, carried Crusaders to and from the Middle East and attracted contemporary pirates in their hundreds if not thousands, paved the way for sailing ships that survive today. The humble, cargo hauling round ship is the ancestor of USS Constitution and HMS Victory alike. Ahoy, Pauline! Didn't they use some of these cogs in the Robin Hood movie with Russell Crowe that we saw earlier this year? If so, then I guess the use of the cog was at least accurate to the time frame the movie was supposed to reflect. Forgive me if I am not remembering that correctly, Pirate Queen. Ahoy, Timmy! As I recall that was a cog that took Robin and the boys back to England. As you note, it is quite accurate. Dromons were used to ferry Crusaders and their horses to the Levant within the same time frame. People: "... The Most Cruel"
Sea Monsters: "... Absolutely Incredible"